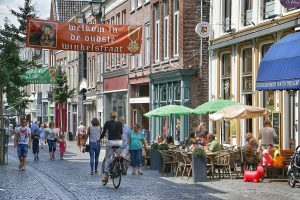 Nijmegen – old city, young vibe! Nijmegen is an old city with a great young vibe. Thousands of students live here and a lot of them stick around after graduating, which gives the place a really modern feel. 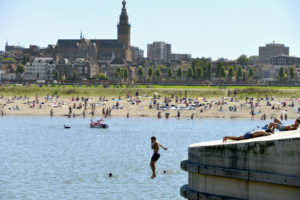 Nijmegen also has kilometres of beach along the River Waal, which runs through the heart of the city. Once you’re done sunbathing you can easily hit one of the pavement cafes in the lively city centre. There are plenty to choose from, as Nijmegen has the highest concentration of pavement cafes in the whole country. And as if there wasn’t already enough going on in the cultural and nightlife scene, Nijmegen has loads of amazing festivals every summer. But that’s not all — right next to the city centre, there’s some beautiful countryside where you can enjoy walks through unspoilt natural surroundings. That’s why we call Nijmegen the Summer Capital of the Netherlands. It’s got all you need for a perfect summer’s day. Here’s the best way to spend your time in Nijmegen, according to the younger residents. Start your day with a walk in the countryside near Nijmegen. Check out the Ooijpolder, the Gelderse Poort or the very un-Dutch hills of Berg en Dal and be surprised by the wild and wonderful beauty of these natural areas just outside the city. See if you can spot the big five in the Ooijpolder — Konik horses, beavers, Galloway cattle, badgers and roe deer! 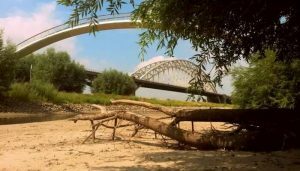 Nijmegen lies on the banks of the River Waal and a new channel — the Spiegelwaal — opened in the river in 2016. The Waal and the Spiegelwaal both have fantastic sandy beaches where you can enjoy the beautiful view over our city and its surroundings, while dipping your feet in the refreshing water. Don’t forget to wave at the ships passing by, the captains will love it if you do! After a summery start to the day, recharge your batteries at one of the many pavement cafes in the city centre or close by in the Bottendaal or Nijmegen-Oost districts. Chat to the locals and don’t miss the brilliant beers from one of Nijmegen’s many breweries. Take the time to explore our city and find out just how rich Nijmegen’s history really is. Don’t only stick to the main shopping streets — the smaller side streets have loads of local shops where you can find a brilliant new outfit or a present for the folks back home. This is also where the locals come to enjoy a hearty meal, why not join them? 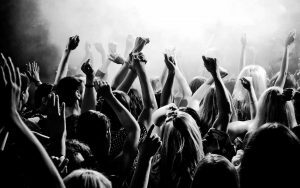 We really know how to party in Nijmegen, so come and join us for a great night out to end your summer’s day! Catch a concert at Doornroosje or in the Goffert park, get down at one of the dance events in the Honig complex or chill out at a pub or Arthouse Lux. And make sure you don’t miss the Four Days Festivities in the third week of July. Attracting 1.5 million visitors, this is Europe’s biggest free outdoor festival! Looking for more tips for the perfect summer’s day or holiday? Check out our site , packed full of must-see sights, nightlife tips and hotspots that are a hit with the locals.